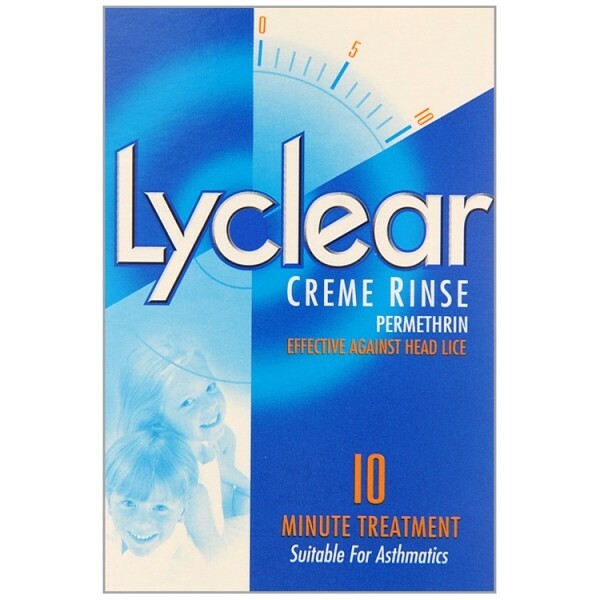 Lyclear Creme Rinse is used as a treatment to get rid of head lice and their eggs. It contains the ingredient permethrin which belongs to a group of medicines called pyrethroids which kill insects such as head lice. Lyclear Creme Rinse is for use in adults and children over 6 months of age. Lyclear Creme Rinse is a light orange coloured cream. Lyclear Creme Rinse is available in packs of one or two 59 ml bottles. Included in the pack is a fine toothed comb which can be used to remove lice and eggs after treatment with Lyclear. Other ingredients: 20% w/w isopropanol, stearalkonium chloride, cetyl alcohol, ceteth-10 (polyoxyl 10 cetyl ether), hydroxyethylcellulose, hydrolysed animal protein, methyl parahydroxybenzoate (E218), balsam fir canada, propyl parahydroxybenzoate (E216), fragrance 06.070, propylene glycol, sunset yellow (E110), anhydrous citric acid and purified water. Not to be swallowed. For external use only. Lyclear Creme Rinse should not irritate the eyes but it is best to avoid it coming into contact with the eyes. Rinse with plenty of cold water immediately should this happen. 1. Shampoo the hair with a mild shampoo. Do not use combined shampoo-conditioner or a medicated shampoo. Rinse thoroughly and towel dry so that the hair remains damp. 2. After shaking the bottle thoroughly, apply sufficient Lyclear Creme Rinse to saturate the hair, roots and scalp. Work methodically through the hair and remember to pay particular attention to the areas behind the ears and around the nape of the neck. For the majority of individuals all of the contents of this pack will be required to ensure that the hair and scalp are well saturated. 3. Leave Lyclear Creme Rinse on the hair for 10 minutes. An application for longer than 10 minutes will not give better results, but a full 10 minutes is required. 4. Rinse thoroughly with water. After the final rinse and while the hair is still wet, use the comb provided in the pack to remove the lice and eggs. Comb the hair in sections from the roots and work over the whole head in this way. Normal hair drying routines can then be followed. One bottle of Lyclear Creme Rinse is usually sufficient to treat one person with shoulder length hair of average thickness, a little more may be required if the person’s hair is especially thick or long. It is unlikely that more than 2 bottles will be required per application. If one member of the family needs treatment, it is important to check the rest of the family for head lice, but only those infested should be treated. If you accidentally apply too much Lyclear Creme Rinse, rinse thoroughly with water. If the contents of the bottle are swallowed, get medical advice from your doctor or the Accident and Emergency Department immediately.